Results of the Project | Professor Denise A. Hines, Ph.D.
We have several projects that we are working on, including two surveys conducted within the United States and one focus group project that includes men from four different English-speaking countries. We will be posting the results of our projects on this webpage as they become available. Data analysis takes a long time, so please check back regularly. If you would like to be on our email list to receive updates to our progress, please click here and complete the form with your name and email address. Thank you. Hines, D. A., Douglas, E. M., & Berger, J. L. (2015). A Self-Report Measure of Legal and Administrative Aggression within Intimate Relationships. Aggressive Behavior, 41, 295-309. Hines, D. A., & Douglas, E. M. (2015). Health Problems of Partner Violence Victims: Comparing Helpseeking Men to a Population-Based Sample. American Journal of Preventive Medicine, 48 (2), 136-144. Hines, D. A., & Douglas, E. M. (2014). Sexual Assault Experiences Among Male Victims of Physical Partner Violence: Prevalence, Severity, and Health Correlates for Male Victims and their Children. Archives of Sexual Behavior, online first. Hines, D. A., & Douglas, E. M. (2016). Relative influence of various forms of partner violence on the health of male victims: Study of a help seeking sample. Psychology of Men and Masculinity, 17(1), 3-16. Berger, J. A., Douglas, E. M., & Hines, D. A. (2015). The Mental Health of Male Victims and Their Children Affected by Legal and Administrative Partner Aggression. Aggressive Behavior, online first. Douglas, E. M., & Hines, D. A. (in press). Children Whose Fathers Seek Help for Partner Violence Victimization: Descriptive Characteristics and Their Behavioral Health, As Compared to a Population-Based Sample. Violence and Victims. Douglas, E. M., & Hines, D. A. (in press). Children’s Exposure to Partner Violence in Homes Where Men Seek Help for Partner Violence Victimization. Journal of Family Violence. 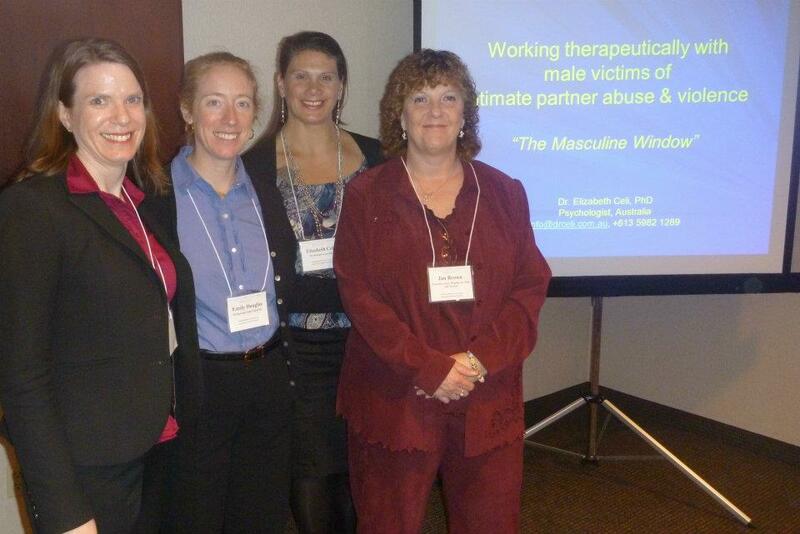 Denise Hines, Ph.D., and Emily Douglas, Ph.D., conducted this focus group study in collaboration with Elizabeth Celi, Ph.D., Louise Dixon, Ph.D., and Alexandra Lysova, Ph.D. At the time of data collection, the researchers represented the countries of the USA, UK, Canada, and Australia, and we recruited men for three focus groups in each country. Data analysis and report writing is ongoing. However, we presented some preliminary results in July 2016 at the International Family Violence and Child Victimization Research Conference. 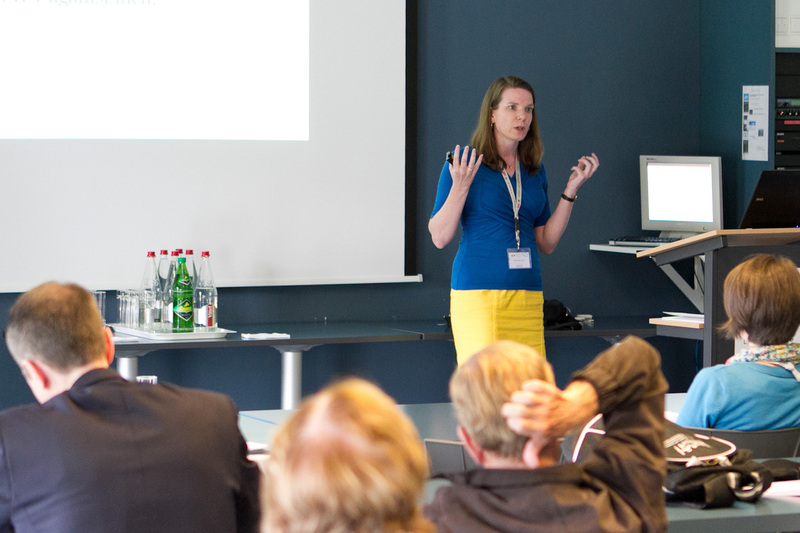 A link to the program book, which contains the abstracts of our presentations, can be found at http://cola.unh.edu/sites/cola.unh.edu/files/departments/Family%20Research%20Laboratory/conference/2016_Program_Final_1.pdf. We will continue to post updates on our progress on publications from this study as they are available. We’d like to thank Sean C. McCarthy for working on a series of fact sheets that succinctly summarize our main study findings. These findings are or will be elaborated upon in our publications, but the fact sheets can be quite useful for policymakers or practitioners who want “just the facts” without all of the jargon and background theory that research journal articles tend to have. Fact sheet #1: Intimate Terrorism by Women Towards Men: Does it Exist? Fact sheet #5: Where Do Men Seek Help and How Helpful Are Those Resources? (1) Hines, Denise A., & Douglas, Emily M. (2010). Intimate terrorism by women towards men: Does it exist? . Journal of Aggression, Conflict, and Peace Research, 2(3), 36-56. (2) Hines, Denise A., & Douglas, Emily M. (2010). A closer look at men who sustain intimate terrorism by women. Partner Abuse, 1(3), 286-313. (3) Hines, Denise A., & Douglas, Emily M. (2011). Symptoms of posttraumatic stress disorder in men who sustain intimate partner violence: A study of helpseeking and community samples. Psychology of Men and Masculinity, 12 (2), 112-127. (4) Douglas, Emily M., & Hines, Denise A. (2011). The Helpseeking Experiences of Men Who Sustain Intimate Partner Violence: An Overlooked Population and Implications for Practice. Journal of Family Violence, online first. (5) Hines, Denise A., & Douglas, Emily M. (2012). Alcohol and Drug Abuse in Men Who Sustain Intimate Partner Violence. Aggressive Behavior, 38 (1), 31-46. (6) Douglas, Emily M., Hines, Denise A., & McCarthy, Sean C. (2012). Men Who Sustain Female-to-Male Partner Violence: Factors Associated With Where They Seek Help and How They Rate Those Resources. Violence and Victims, 27 (6), 871-894. (7) Hines, Denise A., & Douglas, Emily M. (2013). Predicting Potentially Life-Threatening Partner Violence by Women Toward Men: A Preliminary Analysis. Violence and Victims, 28 (5), 751-771. Ending Domestic Violence: Innovations in Practice and Research Conference. 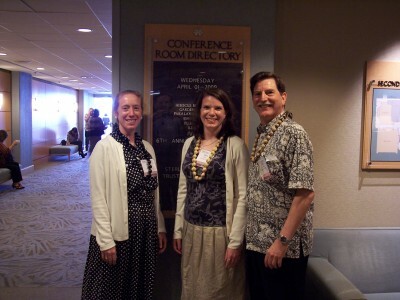 (from left to right) Emily M. Douglas, Denise A. Hines, and Robert Geffner (conference organizer and fellow presenter on female domestic violence offenders) at the 6th Annual Hawaii Conference on Preventing, Assessing, and Treating Child, Adolescent, and Adult Trauma, April 1, 2009, Honolulu, Hawaii, sponsored by the Institute on Violence, Abuse, and Trauma. 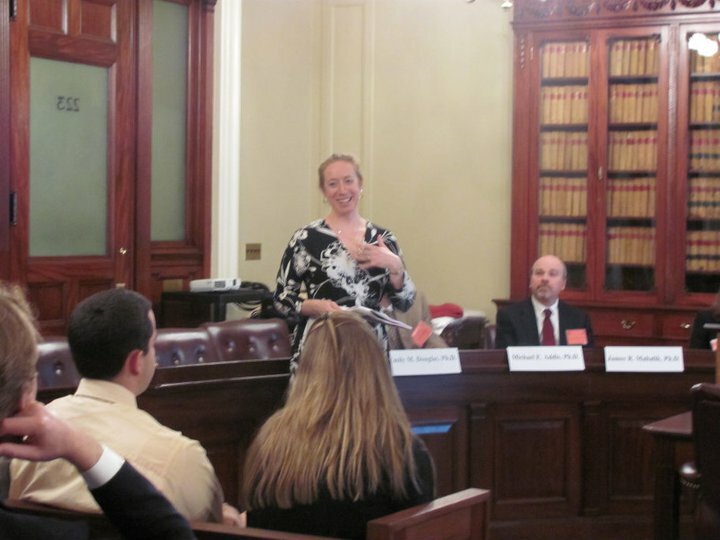 Presentation by Emily M. Douglas at the 2011 Massachusetts Family Impact Seminar, held at the State House, Boston, MA, March 30, 2011. Presentation by Denise A. Hines at Senator Cools’ Roundtable on Family Dynamics, in May 2011, at Parliament in Ottawa, Ontario, Canada. 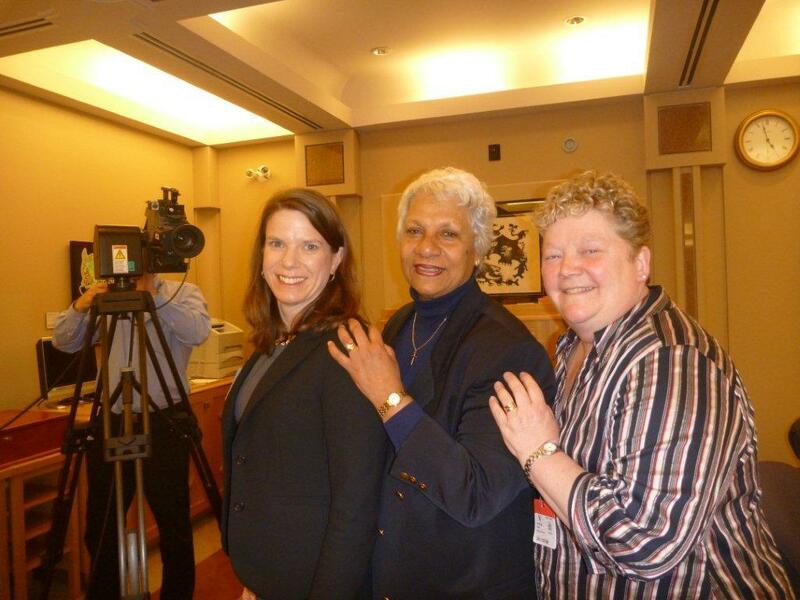 From left to right: Denise A. Hines, Senator Anne Cools, and Dr. Dale Stack. Panel presentation on “Understanding and Helping Male Victims of Intimate Terrorism” at the Ending Domestic and Sexual Violence: Innovations in Practice and Research Conference, November 2011, in Portsmouth, NH. From left to right: Denise A. Hines, Emily M. Douglas, Elizabeth Celi, and Jan Brown. 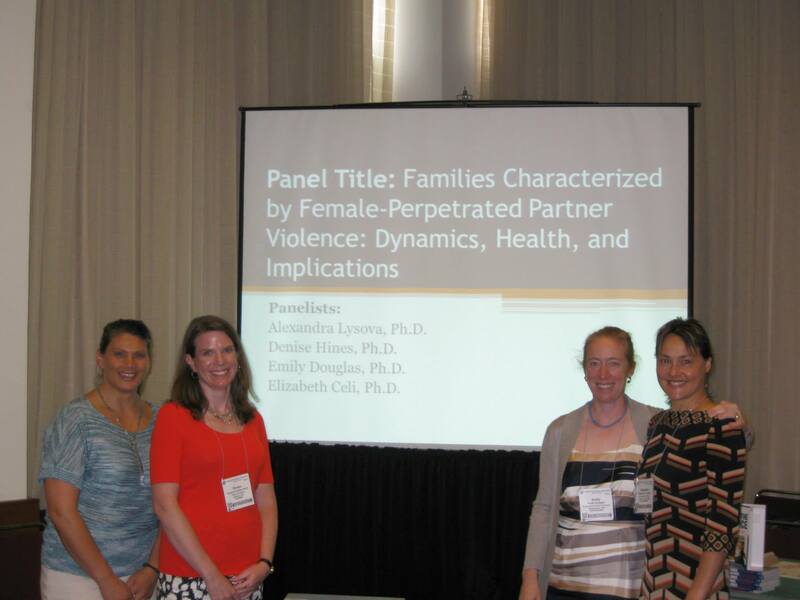 from left: Elizabeth Celi, Denise Hines, Emily Douglas, and Alexandra Lysova presented research on male victims of partner violence, female perpetrators, and child witnesses at the APA’s Annual Convention in Honolulu, HI, August 2013. 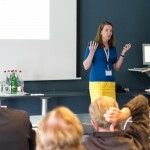 Denise Hines speaking on “Predicting Life-Threatening Partner Violence by Women Towards Men” at the biennial conference of the International Society for Research on Aggression, July 2012. Luxembourg.